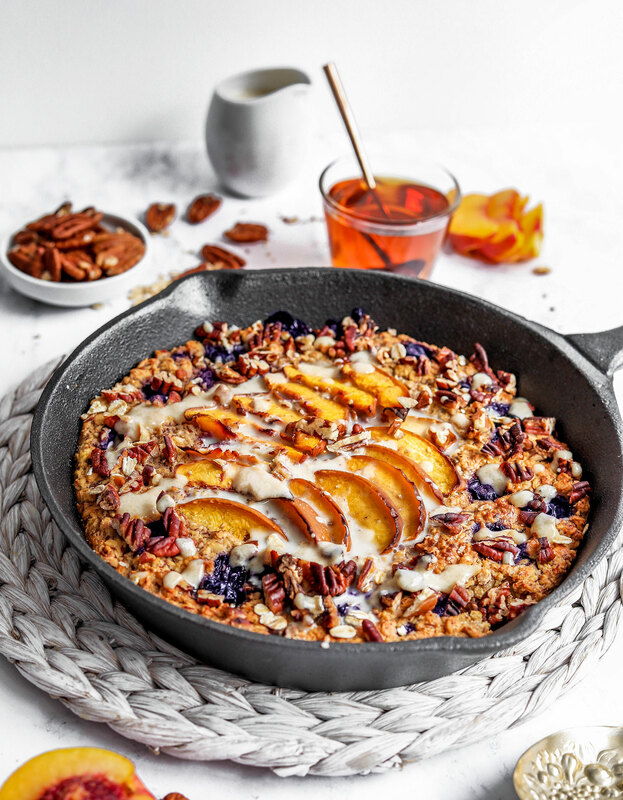 Now that the weather is finally getting colder, my breakfasts are now changing from frozen smoothie bowls to porridge and my new favourite, baked porridge! 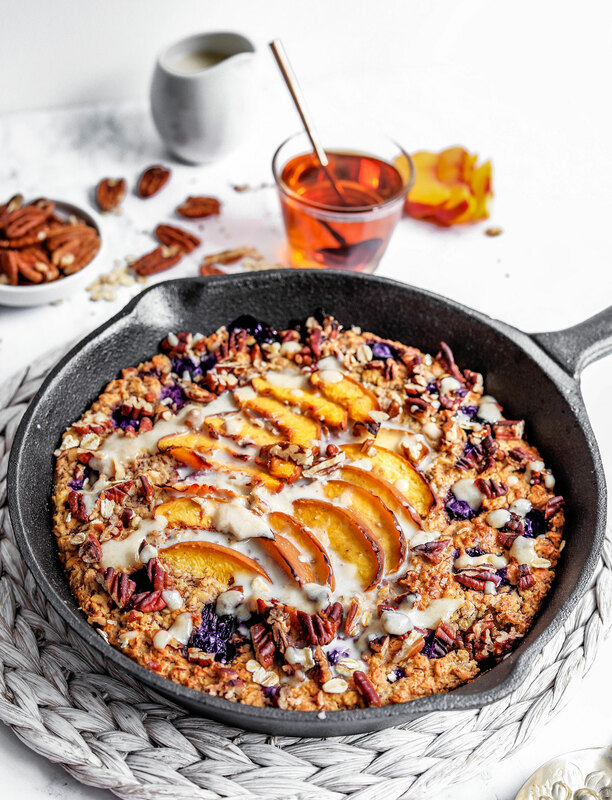 Or baked oatmeal as it’s known in other parts of the world. I’m finding myself craving warm breakfasts more and more. And I know once the UK winter kicks in, I’ll say goodbye to my smoothie bowls for good (well, until next spring! ), as I welcome bowls of comforting, stodgy oats. One of the things I really miss about winter is my morning bowl of oats, that as well as copious amounts of warm beverages and oversized, thick jumpers. All three are the definition of comfort to me. 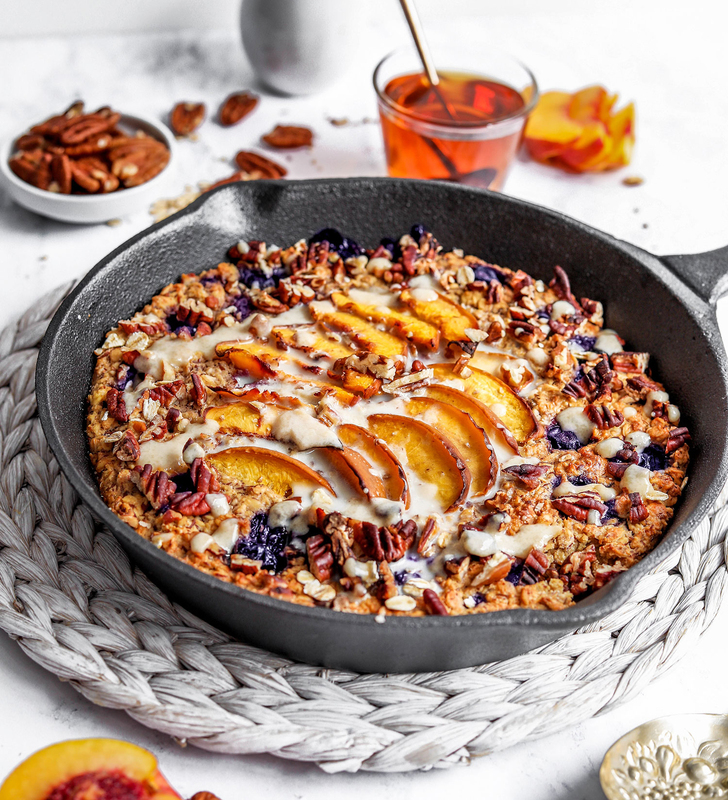 When I don’t have time to make porridge in the morning, a good warm breakfast to have is baked oats. You can make it the night before and warm it in the microwave for a couple of minutes and enjoy it warm with a dash of milk, or even custard if you’re feeling brave! It’s also a really nice breakfast to enjoy on a chilled weekend morning if you want to prepare it fresh. You even have the option of popping it in tupperware and taking it with you to work, school or college. 2 tbsp maple syrup – or you can use any other liquid sweetener like honey, date syrup, etc. 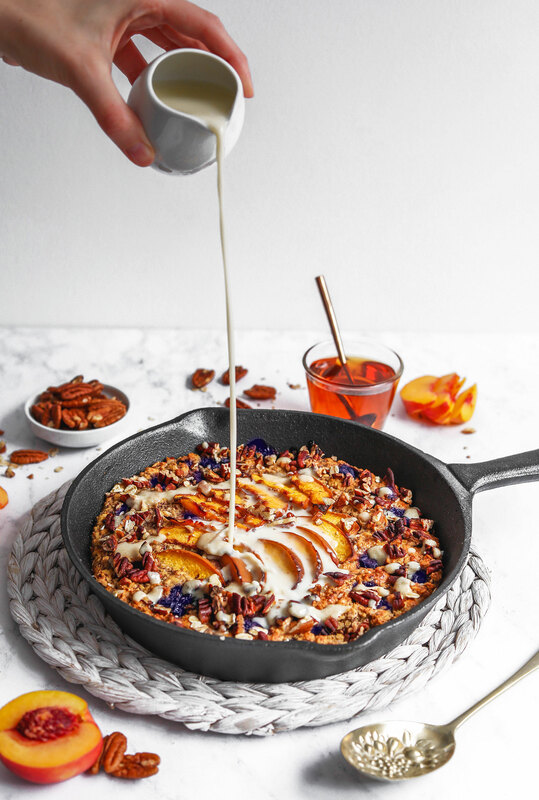 Prepare the flax eggs by mixing 2 tbsp milled flaxseed with 5 tbsp of warm water. Leave to set for 10 minutes. Preheat your oven to 190C/170C fan/350F. 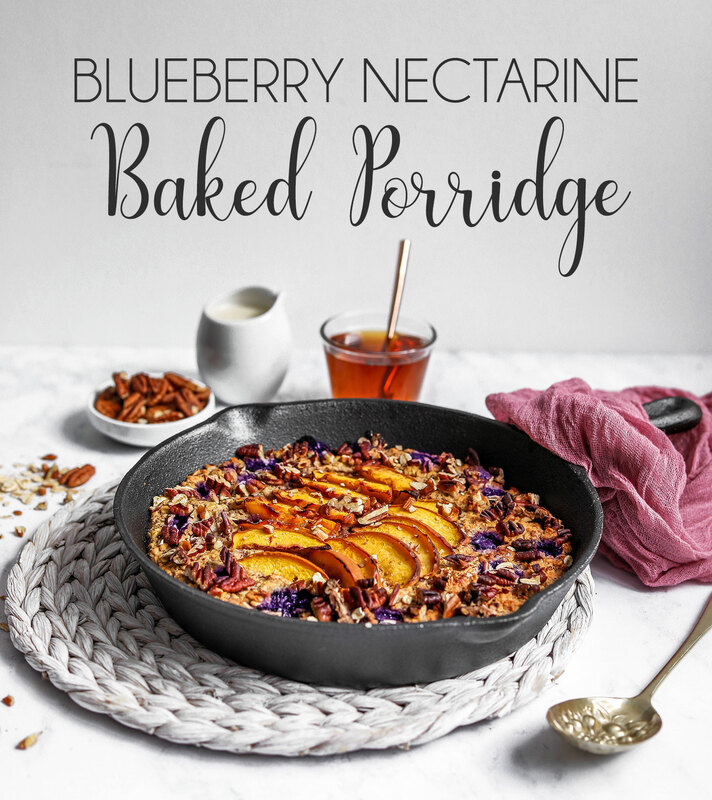 In a large bowl, mix together the oats, salt and baking powder. 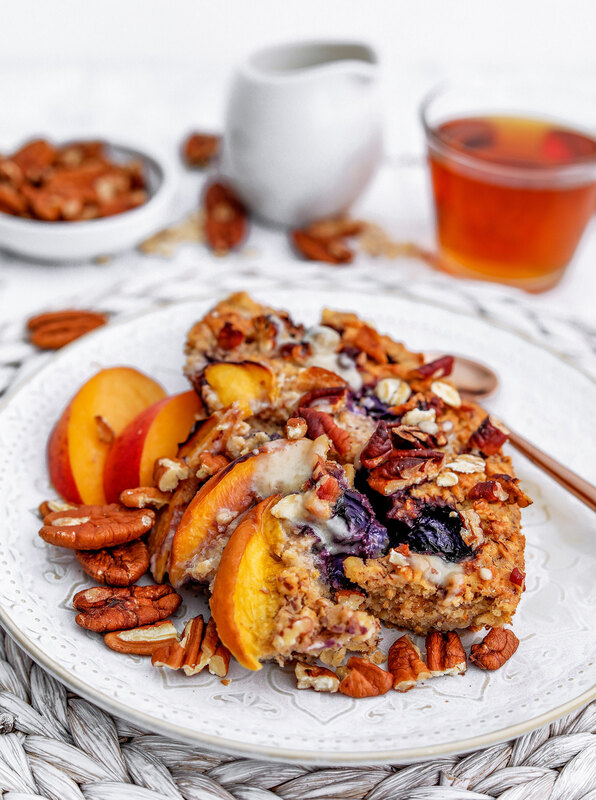 Mix in the milk, maple syrup, almond butter and the set flax eggs, then fold in the blueberries. 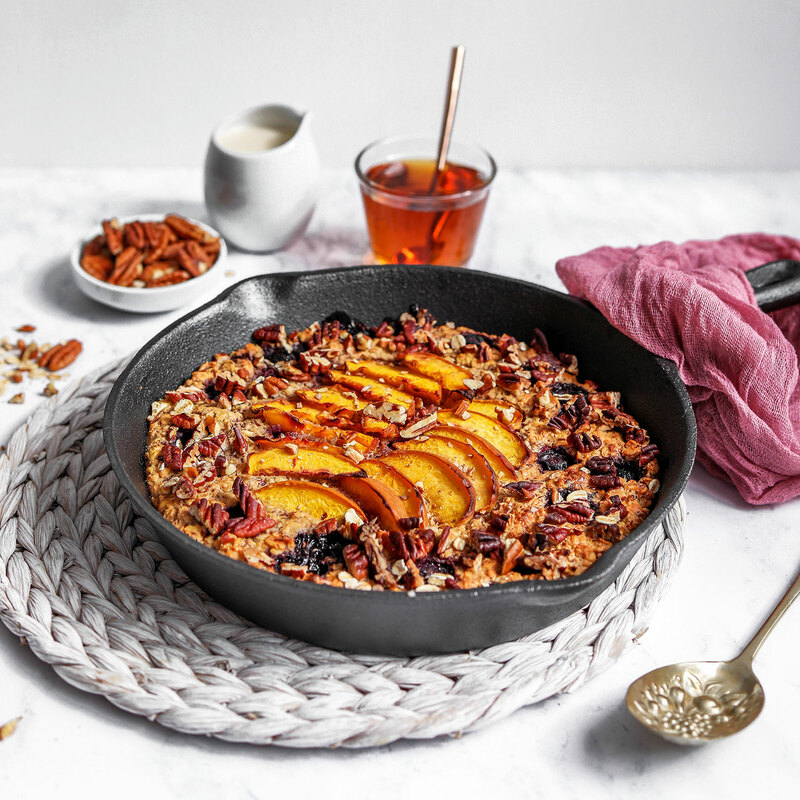 Transfer into an 8″ cast iron skillet or a baking dish, then arrange the nectarine slices on top and scatter over the chopped pecans. Best served warm, but can also be enjoyed cold from the fridge. This looks amazing and gorgeous shots, as always! Have a great weekend! 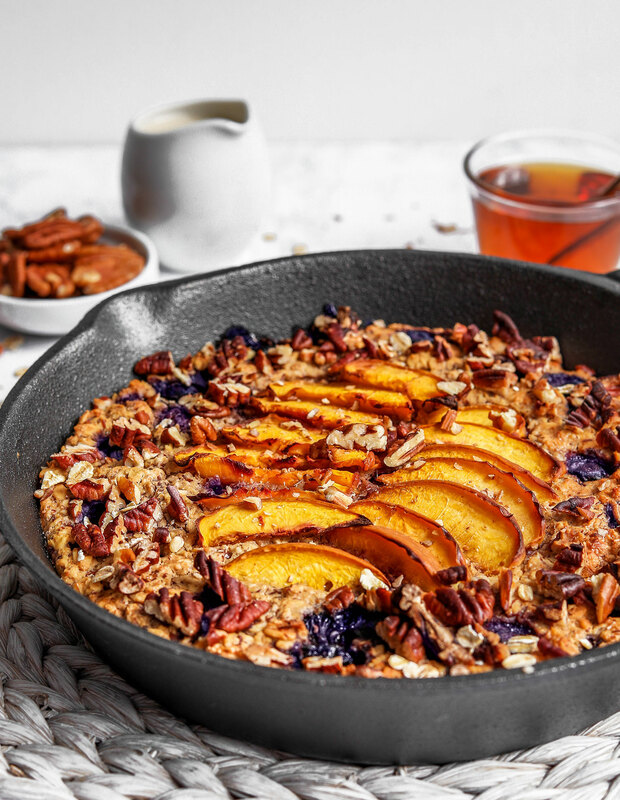 I LOVE baked oatmeal. It tastes like eating cake for breakfast! 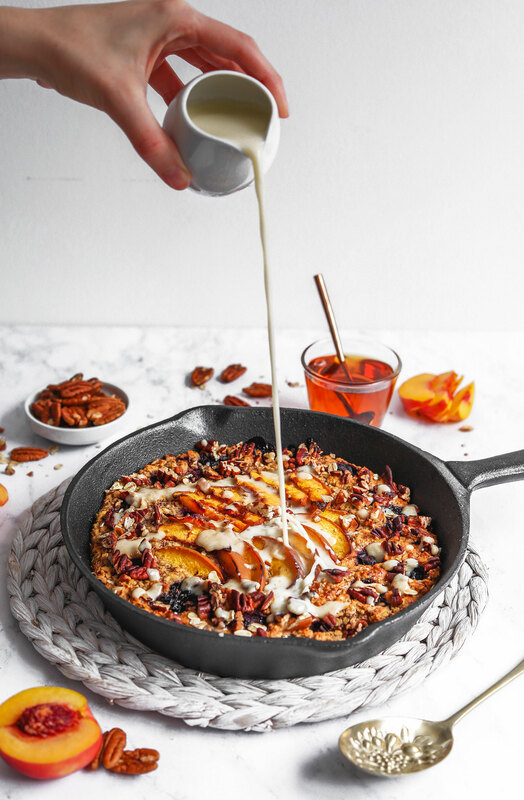 😀 This beautiful porridge skillet looks so decadent and divine for a fancy morning. 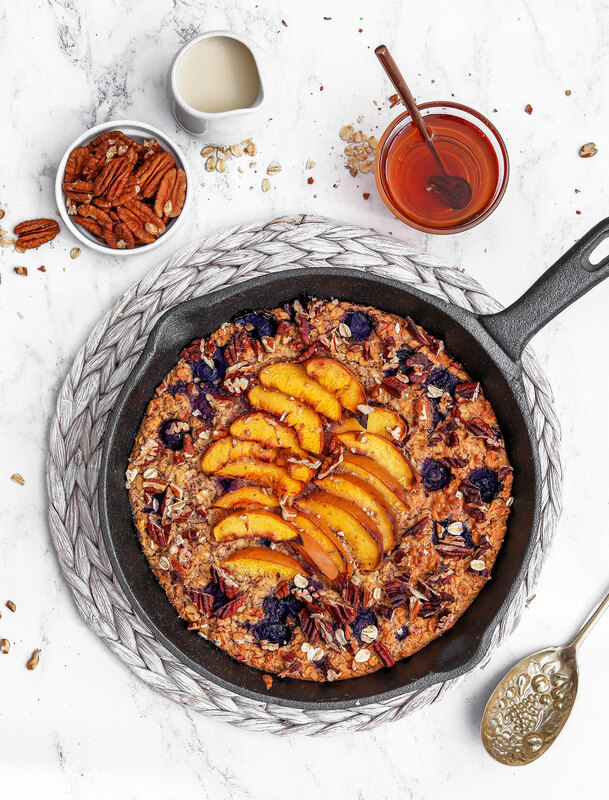 I definitely need a nice oven-safe bowl or deep dish skillet to start baking my oatmeal again. I really miss enjoying it! Is that cream you drizzle over? This looks amazing and can’t wait to make it! Will it store in the refrigerator for a few days as well?